The Ivation Cordless Automatic Electric Milk Frother allows you to cook up a creamy cup of coffee at just the touch of a button. Both a frother, warmer, and steamer of milk, the Ivation Cordless Automatic Electric Milk Frother is a morning must-have for all lovers of cappuccinos, lattes, espressos, and hot chocolate. The Ivation Cordless Automatic Electric Milk Frother is capable of creaming up a cup of milk in only just a few seconds, bringing your usual order from your favorite coffee shop down the block right to your very own kitchen, meaning this milk frother comes with convenience, instant gratification, easier and more rejuvenated mornings, and more money in your wallet since you no longer have to spend tons of money on any expensive café habits. 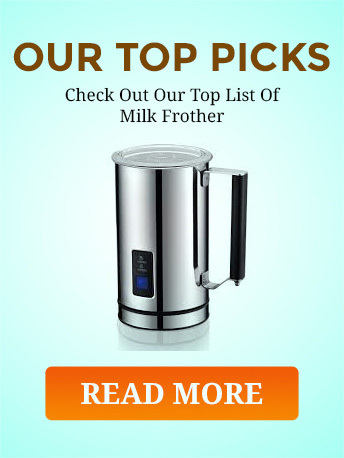 For extra convenience, the Ivation Cordless Automatic Electric Milk Frother also comes with dual setting modes for hot and cold milk froths, meaning that the list of drinks you can enjoy, no matter how the weather is outside, is endless. 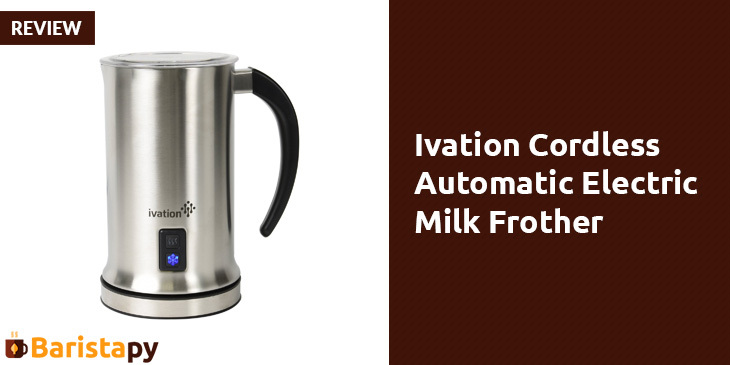 Because the Ivation Cordless Automatic Electric Milk Frother is a cordless and portable device, you can easily lift the pitcher off from the detachable swivel base once your milk is finished being frothed, steamed, or heated. These features make it easier to serve all around your kitchen table. It even produces less waste, making it environmentally friendly as well as convenient. If you’re the type of person who’s lazy and sluggish before you get your daily fix of caffeine, then don’t worry. We’ve all been there, and this milk frother gets it too, which is why it’s automatic and fast when it comes to giving you the caffeine fix you need to get buzzed up and ready to go for the day. With one-touch frothing, all you have to do is simply pour in the correct or desired amount of milk, push a single button, and enjoy a mug of creamy, delicious, caffeinated goodness in just seconds. 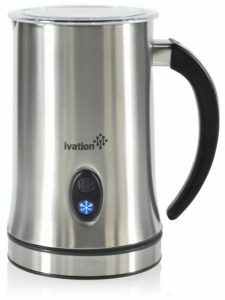 The pitcher of the Ivation Cordless Automatic Electric Milk Frother accommodates up to 125ml of milk for frothing and up to 250ml of milk for heating, meaning that one batch is enough to top off any number of drinks. Also, the non-stick interior makes it easier to clean up after use. With the special dual hot and cold setting modes, the Ivation Cordless Automatic Electric Milk Frother is an innovate milk frother that can do it all, from copious amounts of warm frothiness to gently heated milk for hot chocolate or coldly frothed creaminess to cool off any drink. The powerful, built-in heating element is rated at up to 500 watts and can deliver both rapid heating and frothing. The heating element is fully enclosed within the device for the safety of you and your family, and the handle is heat-resistant so it will always remain perfectly cool to the touch. Q: Does the Ivation Cordless Automatic Electric Milk Frother froth non-dairy types of milk like almond, soy, or coconut milk? A: Yes, the Ivation Cordless Automatic Electric Milk Frother can froth all kinds of milk, such as whole, skim, soy, almond, and coconut. Q: Are there any plastic parts inside of the kettle? Q: I am an elderly person, would I have to press the button really hard in order for it to work? A: No, the one-touch frothing is very light, simple, and easy to use. Jamie E. Clark is the Editor of Baristapy. Who is a Shower Head enthusiast and love to share what he know about this field. In personal life he is a father of two cute kids and loving husband of a beautiful wife. He love foods and nothing is more important than reading book in his spare time.